We custom build each of these complete Strat® pickguard assemblies in our shop by hand for every customer based on the unique specifications selected below. Includes everything ready to drop in to your favorite Strat® by simply hooking up the hot wire (audio) and ground wires. This pickup set is available in very limited quantities and comes directly from the Fender Custom Shop, they are not your typical retail packaged pickups, these '66 relic Strat pickups were originally wound specifically for a completed '66 Relic Strat. We're not creating an entire relic pickguard assembly, it is just the pickups that were relic'd at Fender so the pickup's pole pieces are darker due to the aging process Fender used. Includes genuine Fender pickguard, knobs, switch tip along with top quality CTS potentiometers, Orange Drop polyester film tone capacitors and a CRL pickup selector switch. The standard 11 hole pickguards are fully shielded as they come from Fender. The '62 vintage and '57 vintage pickguards require a separate aluminum pickguard shield which is to be added extra if so desired. Use separate "Add to Cart" buttons found below for addition of these pickguard shields. 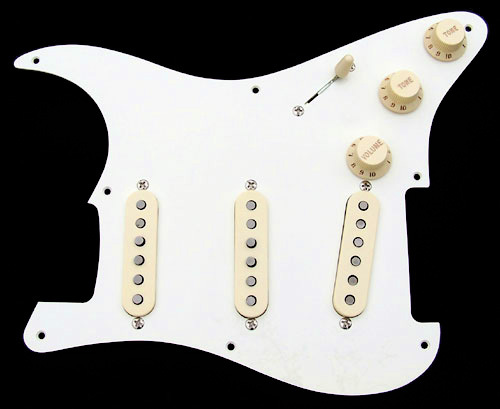 We offer a few assembly selection options for your pickguard to appeal to your particular Strat® body color. Pickup Set: Genuine Fender® Custom Shop '66 Relic. Potentiometers: Three 250K CTS Audio Taper. Tone Capacitor: Film Orange Drop Polyester Film Capacitor Options. Click here for information on tone capacitors and here is a link to a video that explains How Tone Capacitors Work. Pickup Tone Controls: With standard Strat® wiring and with the bridge pickup does not have a tone control, only the middle and neck pickups have a tone control. However, we offer 5 alternate pickup tone control selections to choose from to enhance your tonal shaping. 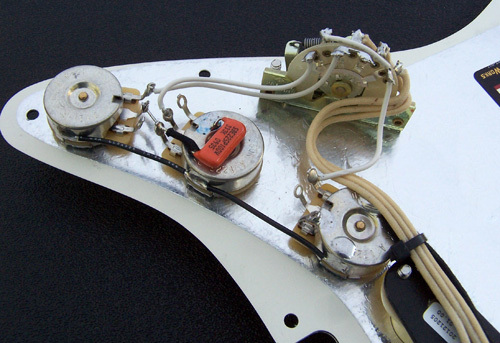 Standard Strat® wiring: Separate tone control for the middle pickup. Separate tone control for the neck pickup. No tone control for the bridge pickup. Separate tone control for the bridge pickup. Middle and neck pickups share a tone control. Separate tone control for the neck pickup. Bridge and middle pickups share a tone control. Separate tone control for the bridge pickup. Separate tone control for the neck pickup. No tone control for the middle pickup. Separate tone control for the bridge pickup. Separate tone control for the middle pickup. No tone control for the neck pickup. We don't have any fancy or creative word play to work up a catchy description for these '66 relic Strat pickups other than they were wound by the Fender Custom Shop for a 1966 Fender Strat as a completed guitar. If you think you'd like the tonality of a '66 Strat then give these a try. There are only a small number of sets of these pickups available. They were offered to us by Fender as surplus since the '66 Relic Custom Shop Strat was no longer being built. Representative photograph. '57 vintage, 1 ply, 8 hole pickguard, with aged white accessories. Representative photograph of a completed pickguard assembly. Representative photograph of controls wiring. Important Note: If you are selecting your pickguard assembly to be built with one of the '62 vintage pickguards or '57 vintage pickguard they are unshielded as provided by Fender. To have the genuine Fender® aluminum '62 pickguard shield or '57 control area shield installed please add it separately below using the appropriate "Add to Cart" button. The '62 vintage aluminum pickguard shield is a full pickguard coverage shield. The '57 vintage aluminum pickguard shield is a control area only shield. These shielding's are specific and authentic to how they were originally built by Fender® during the respective era. Use the following "Add On" options for upgrades to the basic pickguard assembly. To add the aluminum pickguard shield for the '62 vintage pickguard. $17.00 Up charge. To add the aluminum pickguard control area shield for the '57 vintage pickguard. $7.00 Up charge. Upgrade with a customized set of '62 Style Green Lettered & Numbered Control Knobs: $25.00 Up charge. Typical turn-around time from order placement until your complete pickguard assembly will be ready to ship is up to 21 days. All custom built pickguard assemblies sales are final. No returns, refunds or exchanges due to the unique nature of the customized options you select for your particular assembly. Each pickguard assembly is custom built on an "As Ordered" basis for each customer with your specific and unique assembly options selected at the time of purchase. 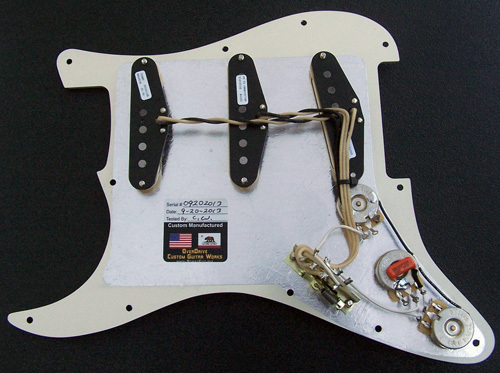 All pickguard assemblies are completely tested to ensure 100% correct operation.